Whether you smoke Cuban cigars regularly, occasionally, or not at all, you would definitely be missing something if you were staying in a casa particular in Cuba and were not planning to visit a Cuban cigar factory. Most are centrally located in towns and are probably near your casa particular in Havana for example. Make sure you go to the Partagás Factory, arguably Cuba’s best known cigar factory. Built in 1845, Partagás is one of the oldest cigar factories in Havana. It is located on calle industria 520, in Centro Havana, at walking distance from a casa particular in Havana Centro that is part of our quality network; Casa Mabel, Casa de Esther, Casa Roseland, Casa Vivan and Casa Ilsia. If you are ready to walk a bit further, take a taxi or public transport you can also go to la Corona Factory and the world famous Romeo y Julieta Factory, which is also home to the H. Upmann brand and premium Montecristos. If you are looking to buy cigars, you will find many options in Cuba. Again, you will not need to walk far away from your casa particular in Cuba to find official cigar shops. 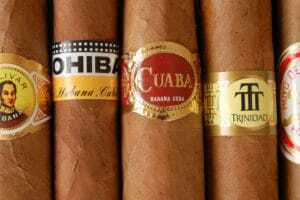 These are the safest options to buy cigars whether you decided to stay in a casa particular in Havana, a casa particular in Trinidad or elsewhere on the island. Prices are higher than on the black market but still much cheaper than if you bought cigars at home. Talking about the black market, you may find illegal sellers around the streets of Havana but do not buy from them as you may come across really bad quality or fake cigars. Your casa particular in Havana is likely to know someone who rolls cigars in a factory, and your casa particular in Vinales is likely to know someone who actually grows and cures the tobacco, so it’s always worth asking the hosts in your casa particular. Enjoy!